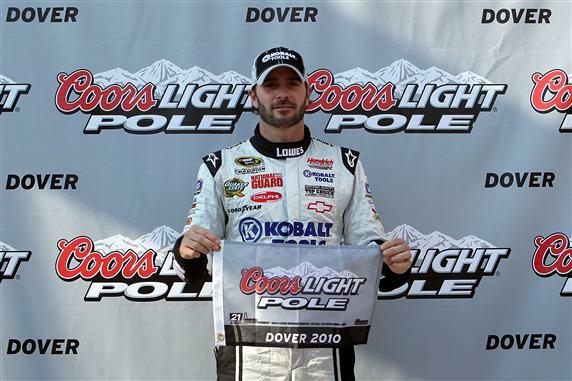 After a frighteningly bad start to the 2010 Chase for the Sprint Cup at New Hampshire last weekend, Jimmie Johnson and his #48 Lowes-sponsored Hendrick Motorsports team conquered the "Monster Mile" in NASCAR Sprint Cup qualifying for Dover International Speedway's AAA 400. Taking a late draw in the qualifying order, Johnson overcame a 19th fastest time in the Friday morning practice session to beat out AJ Allmendinger and Martin Truex Jr for the third 2010 pole for the #48 Chevrolet. Driver fastest in practice Ryan Newman could only muster a 14th place run during the time trial at Dover. NASCAR Sprint Cup Chase leader Denny Hamlin starts 4th for Sunday's race, 2nd place challenger Kevin Harvick (elevated to the position after a 150 point NASCAR penalty dropped Clint Bowyer from 2nd to 12th) will be working his way up from another poor start 33rd on the field. Scheduled for Sunday afternoon at about 1:00 P.M. the engines will start for the second race within the 2010 Chase for the Sprint Cup.